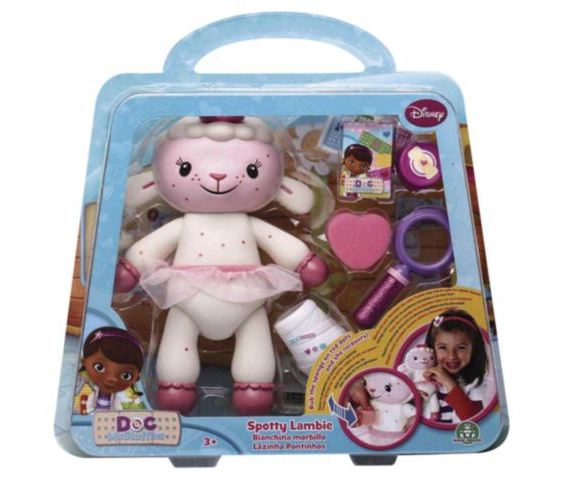 Any young Doc McStuffins fans will be familiar with Lambie, the cute little lamb who loves to help her friend Dottie. Unfortunately in this Spotty Lambie playset, she isn’t feeling very well and comes covered in red spots. This set enables young children to act the part of the doctor and make poor Lambie better. The playset consists of a good sized Lambie, perfect for cuddles and role play. She has a soft rubberised body and limbs with a pretty net skirt. Both her arms and legs move to enable play. The set also contains a glittery magnifying glass, sponge, pot of cream (empty), plaster cast, plaster box and four removable plaster stickers. The set is aimed and both boys and girls age 3+ and one thing both my children love is playing doctors. They are always asking for anything medical related so I knew this is a toy they would enjoy. Mister B who is 3yrs old was the first to examine Spotty Lambie to see what was wrong. Spotty Lambie comes covered in red dots to make her look poorly. Being thermo sensitive ink, these just require a little rub with the magic sponge or a finger to make them disappear, therefore making Lambie all better again. Mister B was fascinated by this and was also kept amused when they reappeared again requiring him to quickly grab the magic sponge again. 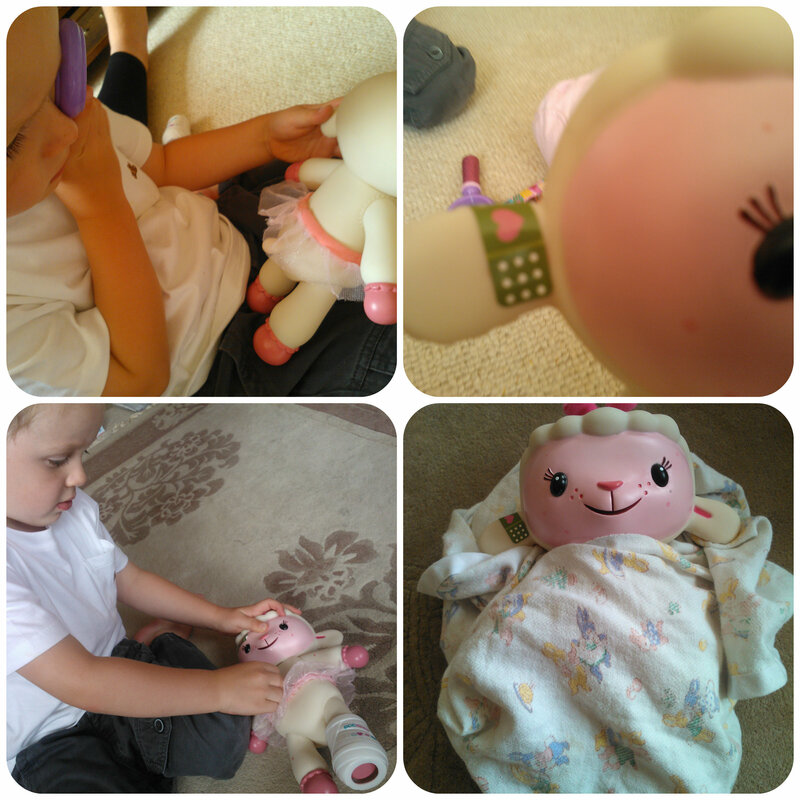 Miss M enjoyed putting the plaster cast on Lambie’s leg and also showing Mister B how to care for her. Mister B eagerly watched and took on board exactly how to care for a sick patient! The little plasters included are cute and they loved to stick them to wherever they decided Lambie had hurt herself, in this case it was Lambie’s ear. Mister B loves inspecting Lambie with the little magnifying glass and even hunts around the house looking for things through it. They then decided to put Lambie to bed and Miss M carefully wrapped Lambie up in a blanket to go to sleep. Get well soon Lambie! 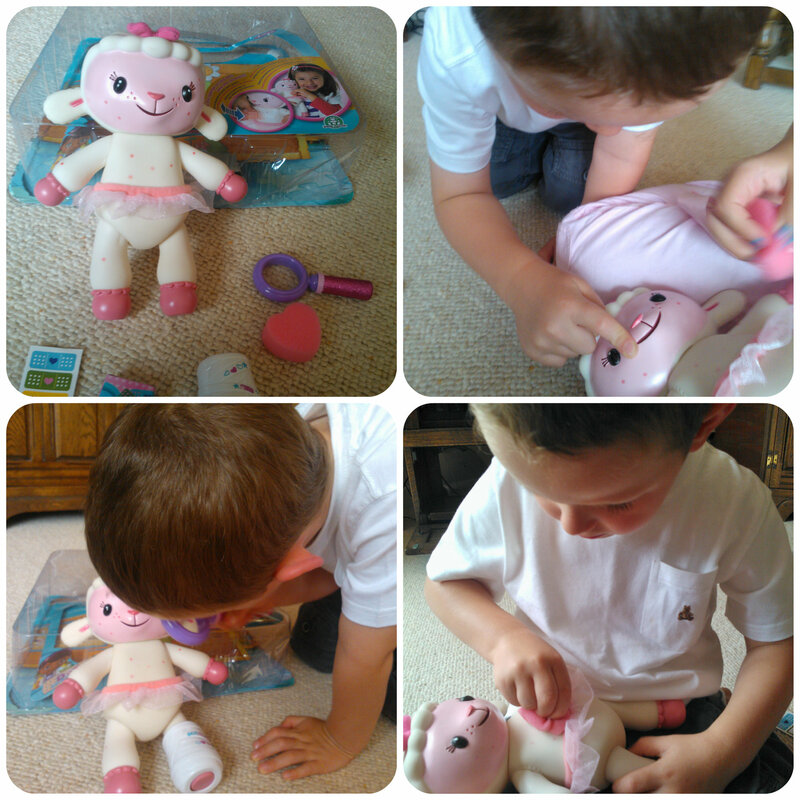 The Spotty Lambie playset from Doc McStuffins is a great way to encourage children to care for others. It builds up their role play skills and gives them an insight into how to treat people that are ill. We thought this was a great value playset probably best suited to children aged 3-5 years. All reviews are my own and my family’s opinions and the Spotty Lambie playset was sent to us in order to write the review.